Help wolves. Become an International Wolf Center member. Join now for just $20. That's a $15 savings! The mission of the International Wolf Center is to advance the survival of wolf populations by teaching about wolves, their relationship to wildlands and the human role in their future. The Center has an administrative office in Minneapolis, Minnesota, and an interpretive center in Ely, Minnesota, the heart of the Superior National Forest and home to the largest remaining wolf population in the lower 48 states. Ely is the gateway to the pristine, fish-abundant waters of the Boundary Waters Canoe Area Wilderness. 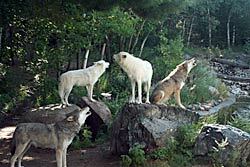 Visit the international educational center in Ely and see the powerful presence of live ambassador wolves just outside the window. They explore, howl, sleep, swim and eat while you watch and take photos a few feet away. Learn from staff naturalists about the wolf's life and how wolves and humans can co-exist. Most daily programs are included with admission. Sign up for a feeding program or night howling trip. If you cannot come to Ely now, watch the ambassador wolves on a live web cam 24 hrs a day on www.wolf.org/wolves/ experience/webcam.asp. You won't be able to resist our interactive and entertaining 6,000-square-foot Wolves and Humans exhibit. It's an award-winning display developed by the Science Museum of Minnesota. 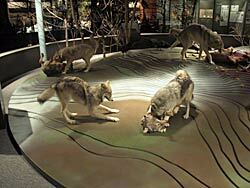 See the history of wolves come alive through lifelike displays, artwork, video games and much more. Listen to different views on a misunderstood species and draw your own conclusions. The Little Wolf exhibit welcomes kids. Crawl into the pup's den and listen for their sounds, explore the four seasons of a pup's first year, discover mysterious holes to follow and lively games and activities. For the more adventurous who like field trips deep into wolf country, there are programs that will help you discover your wild side. You'll howl to wild packs, get first hand experience with wolf research techniques and learn about other animals. 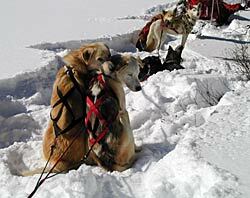 Weekend and week long program activities like dogsledding, radio tracking by airplane and visits to a bear sanctuary will leave you howling for more. Cap off your adventure with a stop at the Wolf Den Store. Our many wolf gifts will remind you of your wonderful visit to wolf country. Still wanting more? Bring the wolves to your classroom through our distance learning programs. Let your teacher know of all the great opportunities that exist under the "Learn" section on our Web site, www.wolf.org/wolves/learn/ educator/distancelearning.asp. Our distance learning programs take you on a trip to the International Wolf Center in Ely, Minnesota without setting foot outside your own classroom! Using the latest technology, we offer engaging programs via two-way videoconferencing. For more information call 218-365-4695, ext. 31. The International Wolf Center envisions a world in which populations of wolves thrive well in many parts of their native range. 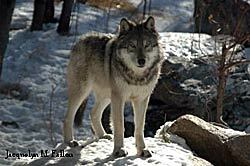 For programs, current admission rates, and hours of operation, check our Web site, www.wolf.org.